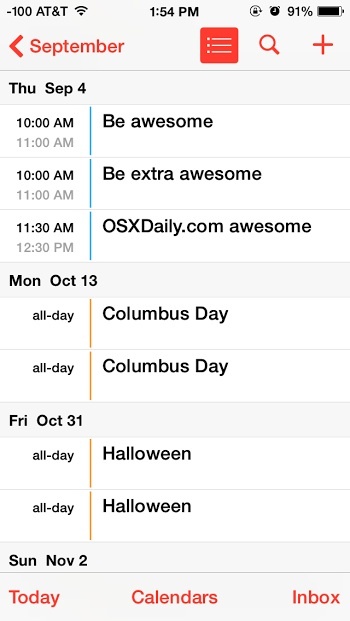 Want to show US Holidays in your iOS Calendar? There are a few ways to accomplish this, and we’ll cover the two simplest methods. First is a direct subscription to the official US holidays calendar offered from Apple, and the other syncs the same calendar from a Mac that has the feature enabled. For the time being this is necessary, because there currently is not a direct toggle to show or hide holidays in the Calendar app on the iPhone, iPad, or iPod touch. We’re focusing on holidays in the USA for this example, but below there are links that include other nation calendars as well. If you have a direct link from Apple’s calendars for your nation, be sure to share it in the comments as well. Note this sample screenshot shows holidays twice while in list view or day view because the feed has been subscribed to directly as outlined above, but also synced from the Mac as outlined in the next step. Do one or the other, not both, unless you want holidays to show up twice like this. What about calendars for other nations holidays? Obviously calendar holidays differ per country, so if you’re in the UK you probably don’t care to celebrate the US 4th of July (or maybe you do). The simplest way to get your respective countries holiday calendar is to use 2nd option outlined above, syncing the holidays from your Mac to your iOS device. The Apple Calendars page has several to choose from, and this link from the UK has bank holidays available to download. Readers are also welcome to share the direct iCloud Calendar URL’s from Apple in the comments, be sure to include the nation of the holiday calendar. We got a few questions about this after showing how to access the new List View in iOS 7.1 because the screenshots show US Holidays… hopefully this answers those questions! When I click on the calendar link on my iPad Air with iOS 7, there is no option to subscribe. It merely lists 174 holidays and gives the option to share the list (but not with calendar). Is there some tick to this? Clicking on the link doesn’t open a subscription option, it opens a calendar & asks if you want to IMPORT the events into your iPhone calendar, either an existing or new calendar. To subscribe you need to go to Settings – Mail, Contacts, Calendars – Add Account, etc., and paste the link. My iOS 7.1 came subscribed, and just opened up when I visited the link. Somehow(?) the calendar on my iPad shows US Holidays three times — once under “iCLOUD” (which is the only one I want to keep), once under “SUBSCRIBED” and once under “OTHER” (i.e., in the same section as “Birthdays”). How/where can I delete those unwanted ones? Thanks! Is there one for UK Holidays? Sorry but I would say that isn’t the correct way to subscribe holidays. 6. Tap “Save” to finish and the holidays will be added automatically! Here is source for the info and there is HK holidays ics links. I think there is an app Let’s Celebrate for iPhone and you can find all the holidays there… It also has more fun holidays. how do I get some of the automatic holiday notifications off my calendar? What if I don’t want all of the holidays listed to be imported. I only want certain holidays. How do we do that? The challenge isn’t getting an Apple Calendar with every idiotic holiday known in the entire snowflake world. The challenge is getting a calendar to add to ical that includes national holidays and holidays the user celebrates. If you could actually delete the stupid holidays, this would be fine. But unfortunately it’s all or nothing. …. 1000 snowflakes to get 20 actual holidays? Seriously? Displaying US holidays on iPhone Calendar has nothing to do with the weather, snow, or snowflakes, unless it happens to snow on Christmas or New Years Eve, which is more coincidental than anything. You can always add your own event to a date and have it repeat every year, that is one way to set the holiday a user celebrates on the iPhone Calendar. Personally I think there should be an option for iPhone Calendar to show only business / official holidays, since to your point there are many other ‘holidays’ that are not actually recognized holidays by any business or government entity and so therefore they are not official holidays in any capacity that impacts business or life. The holidays that impact people are when businesses or offices or schools are closed, so that is what should be prioritized. If I personally declare today “International Two Cups Of Coffee With Cream Day” that does not mean anyone else recognizes it and it does not belong on a calendar, so maybe Apple could allow for custom holidays rather than expanding everything into the iPhone Calendar default.